One stop for all your towel needs in our listing here. These towels are Water absorbent, double lock stitches on the edge and natural colored. Made from natural materials and free from harmful chemicals . High Density: All terry cotton towels made 21 single double yarn ring spun cotton. It means more durable and better water absorbersent. Available Colors : Black, Hot Pink, Aqua, Yellow, White, Lime, Royal Blue, Orange, Kelly Green, Hunter Green, Burgundy, Beige, Red, Chocolate, Purple, Lavender and Navy Blue. -Beach Towels: 35" x 65" has two decorative dobby borders and dobby hem finish. -Bath Towels: 27" x 54" has two decorative dobby borders and dobby hem finish. -Hand Towels: 18" x 32" has two decorative dobby borders and dobby hem finish. -Washcloth Towels: 13" x 13" has one decorative dobby border and dobby hem finish. -Machine washable, wash in warm water. Tumble dry low heat. Beach Towels Measures 35" x 65", Weight for each beach towel 1.6 Lbs. This oversized beach towel is offered in a rainbow of eye-catching colors. 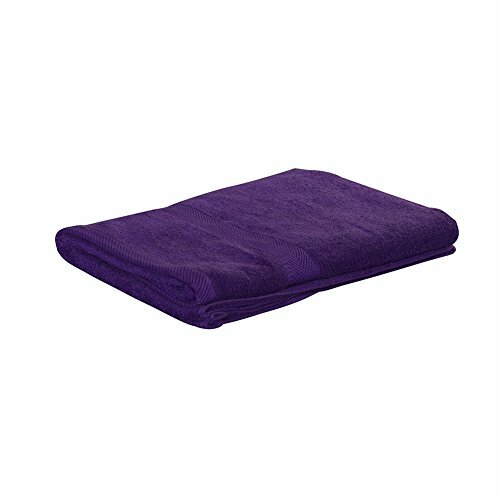 Great as an executive gift, award or incentive, this towel can be imprinted with a logo, name or custom design.